Chiropractic is not a treatment for asthma in Woodbury. 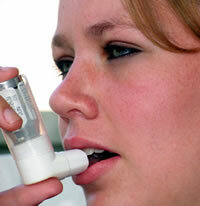 However, many who suffer from asthma report improvement by receiving chiropractic care. Asthma is not, as many believe, an advanced form of allergy. Attacks can be triggered by allergies but the two do not necessarily go hand in hand. In an asthma attack, what actually happens is as follows: the muscular bands in the walls of the bronchial tubes contract, cutting down on the supply of air to the lungs. An asthma attack in Woodbury may last from several minutes to several hours, whatever it’s duration, it seems like an eternity to the victim. Allergies on the other hand, are an unusual susceptibility to a substance that is harmless to the majority of the human race. Stop and think about it, why can 6 people sleep on the same pillow, pet the same cat, eat the same food or smell the same flower and only one of the six will have an allergic reaction. If the pillow, pet, food or flower were the actual cause, all six would suffer the same reaction. The problem lies with the allergy victim. Allergic reactions may vary, but they all have one thing in common, a lowered resistance to the allergen.